last Tutorial Voting made "How to clean your Airbrush" the winner. Thanks for all the votes you jungle painters did. For us it is really amazing to see so many of you involved in Massive Voodoo's year of the painter. Thank you! 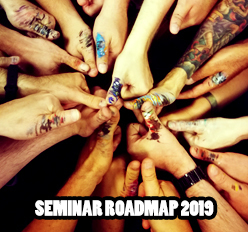 The article is written by Roman and we jump right at his brain about this double-edged topic. Now to the tutorial. We hope you enjoy and find a hint or tip useful. Well, the Airbrush, such a great tool for the miniature painter it can be, but it also can be a pain in the neck when it comes to cleaning it. I learned a lot in the past about cleaning it properly, but I did not learn not to forget cleaning it. There is one really good article by Generalpoleaxe here on Massive Voodoo that he contributed a while ago, but sadly the photos went missing. We have not been able yet to get in contact with him (we tried and try) but if you know him please point him in our direction, to get this back to its former glory. This article really helped me a lot, it still does, even without the photos. I also recieved a lot of help from Raffa, as he explained to me very often and very patient on how to keep my airbrush clean, but sometimes it felt like explaining a rhinocerus to elegantly climb a tree for him. I am sorry for that. 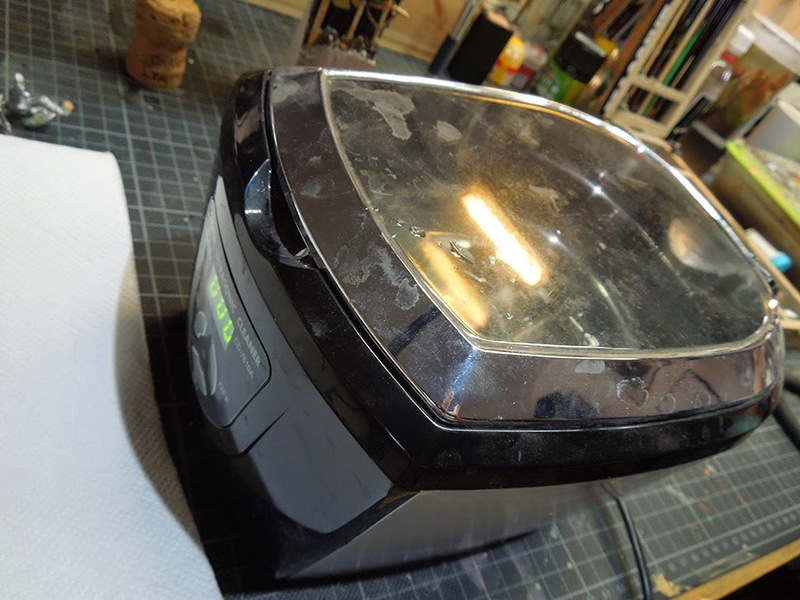 Well, this article shows my thoughts on what I have learned, on how I proceed and on how I try to keep my airbrush maintained during work, also when I forget to clean it properly and got to do a big time clean up. The Airbrush I am using. A Harder&Steenbeck, Evolution 2on1. 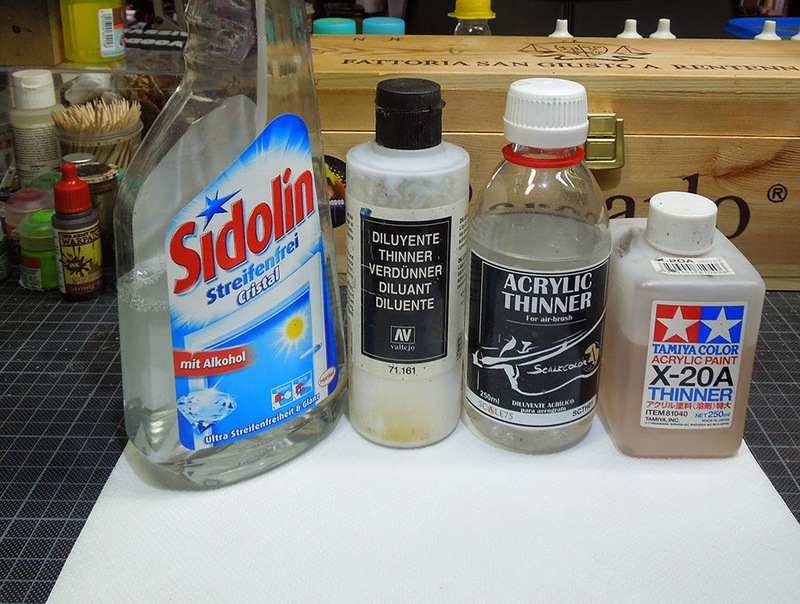 Very important for a clean airbrush are the liquids you clean it with, but before I'll tell you more about the ones I use I have to also drop a line about the thinner liquids. Thinners to make your acrylic or alcoholic colours sprayable. In the past I used to thin my acrylic colours with water only, but this fact in combination with my motivation of cleaning it often lead to a gridlocked gun. There are so many different acrylic colour brands outthere with different mixtures and all behave a little different if thinned down for airbrushing. Very annoying, eh? - The most basic one is just window-cleaner (clear). I use it if I don't find the others. - Vallejo Model Colour Thinner is second. It is the old mixture and it is also used very rare. I did not yet try the new mixture of it. - Recently I mainly use the Acrylic Thinner by Scale75 as the mixture is really good. It really thins down most of the colours I got to a harmonic entity. The colours sprayed with it appear matte and I really feel a good control of it. No surprises during airbrushing. What I want to tell you is: If you have a good solution to thin your colours then cleaning won't be as hard, if you do not forget to clean it regularly. - Schmincke Rapid Airbrush Cleaner. A good choice for a quick clean up in between the work. - Aceton. For the big time clean ups. Very aggressive. When using it, always keep your windo open and wear a breathing mask to protect your lungs. - Revell Airbrush Clean. Not as agressive as Aceton, but also strong in its cleaning powers. - Window cleaner (clear). I use this to clean the airbrush when doing colour switches and sprayed very diluted colours. If you are in the middle of working a model with your Airbrush and do a colour switch, a quick clean up of your airbrush in necessary to make sure you don't have another colour still in your gun. This might ruin your work if such an accident appears. Depending of your colour dilution level you can just go with spraying some non-aggressive cleaner or window cleaner through. 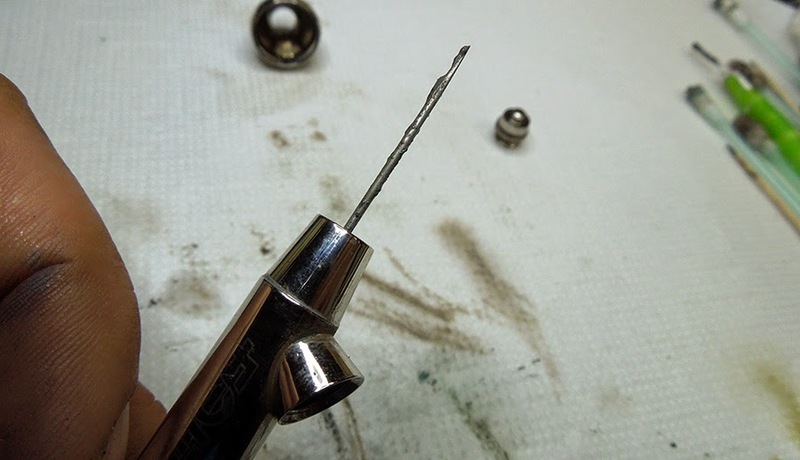 In some cases you might have to clean the needle of your gun and the nozzle. When your session is over and you stop working with the airbrush for today it is very important to not forget to clean it up properly. It is some kind of annoying but it is rather frustrating to find the Airbrush not ready for working on the next day because of your laziness. Let's have a look on the "quick and regular cleaning process". I recommend this airbrush-breakdown to have a look on what we are talking about. For this version of cleaning I focus my clean up to the needle, the noozle, the front caps and the colour pot. I am using a non-aggressive Airbrush Cleaner here as it works pretty fine if you do it regularly. For the noozle I sometimes use a toothpick sucked with Cleaner and carefully push it through. If some remains are hard to remove (which should not happen if you do it regularly) you can also use a small piece of thin wire. Take care not to destroy your tip of the noozle by pushing too hard. Not very professional I know, but better options will be explained in the big-time clean up. I am using a lot of Q-tips to clean these specific areas and a tissue for the needle. This should take you about 3~5 Minutes if you have done it before, are used to your gun and do it regularly. If you don't do it regulary this quick clean up can take you up to ten minutes or more and you fast might recognize that more Q-tips then expected are needed in the end. If this happens often you might prepare yourself for a big time clean up soon. After the quick clean up. 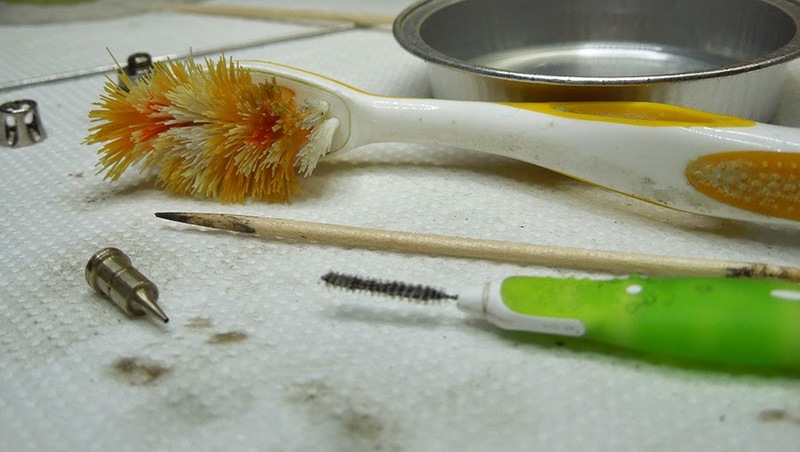 This colour remains and dirt on my q-tips is hard on the edge to a big-time clean up. This is now a complete different situation. It is best explained by imagine you have been off from your workbench for several days, you have been rather lazy with quick clean ups in the past and now you want to start working with the airbrush again. It does not work. No air is flowing through, acutally nothing happens. Ok, check if the compressor is switched on, well it is. Dayumn! Honestly I have to say it does not happen to me too often anymore as I learn from the past, but still sometimes it does. Nothing works and I have to make ready for a big-time clean up of my Airbrush. A really big one. Lazy, stupid me. As I know that this behaviour or stupidity will never leave me in full I decided to prepare myself and bought a cheap ultra sonic cleaner. I am using only water in it and place the airbrush parts in it. Then I give it some runs to get the dirt loosened by ultrasonic-powers.I do only place the parts of the Airbrush that get in touch with colour. No need to place the back of it in there. The number of runs can vary as you see fit. Just have a close look on the water. 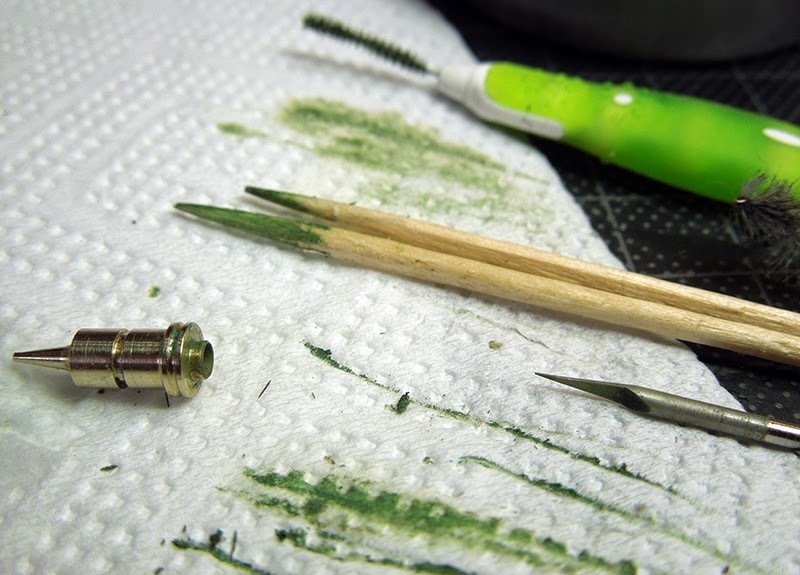 If you see more dirt and dirt appear in it, the airbrush starts to get clean again. The dry and stuck dirt is loosing a bit of its grip, that is what this step is for. After the supersonic bath I start to clean each part seperatly with aggressive cleaner. Using the one from Revell here or directly head for Aceton. VERY IMPORTANT is to remove the non-metal versifications before you start working with aggressive cleaners. If you don't they will get destroyed and you are in need to buy new ones to have your gun work properly again. I've been there, done that. I can only recommend to wear rubber gloves to protect your skin from the aggressive cleaner. If you don't want to cuz you think you are strong, ok, but it is really not healthy. Worst moment you can encounter is a little wound somewhere on your fingers and the cleaner inside it by accident. Been there, do... AHhhhhhhhhhHHH!! Really not a nice moment! 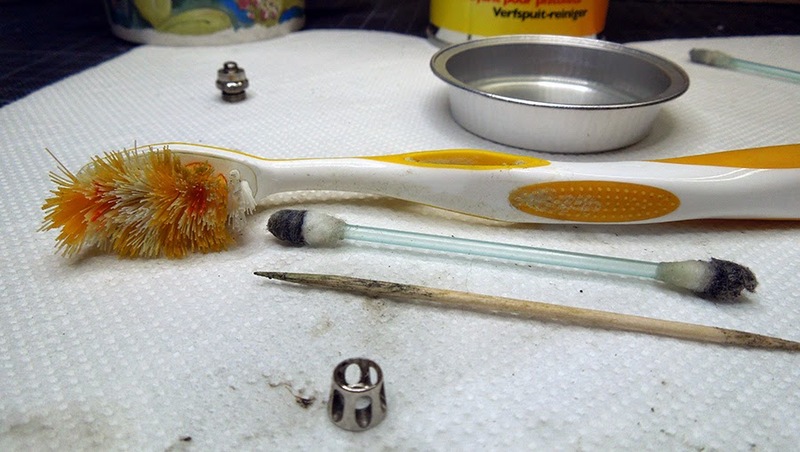 Q-Tip, old toothbrush, toothpick used to clean the needle cap and toothbrush used again to clean the inside of the noozle cap. Don't forget to removethe versification. Cleaning this part now needs all my concentration and I am lucky that the supersonic-bath shake the dirt already. It looks worse than it is. I used the old toothbrush+cleaner to clean the outisde of the part. Next I used a toothpick+cleaner to gently clean the inside. Additional I used a cheap tool for teeth-cleaning from the supermarket + cleaner to rub it carefully around the insides. There are even more professional tools outthere to clean this specific area. 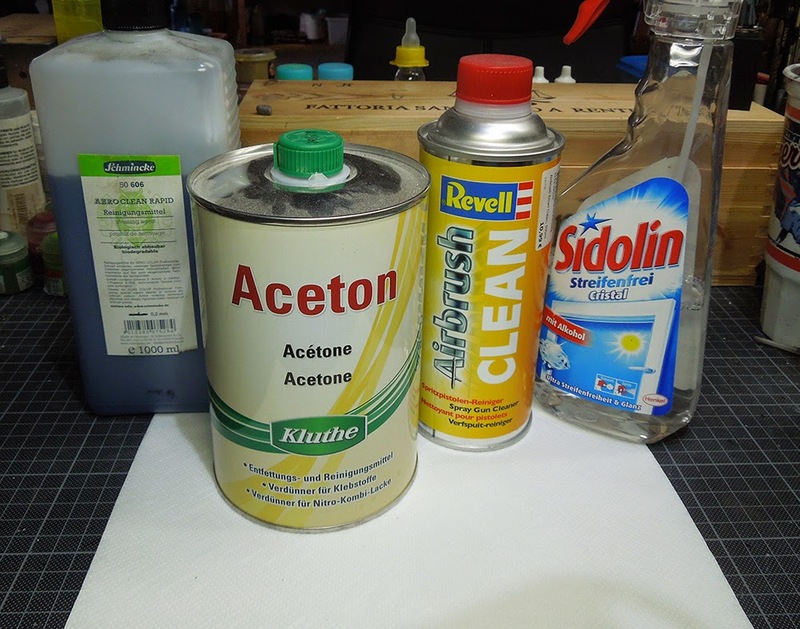 In the following photo you can spot a specific Airbrush-cleaning-tool, made from metal with whom you have best control and cleaning ability. 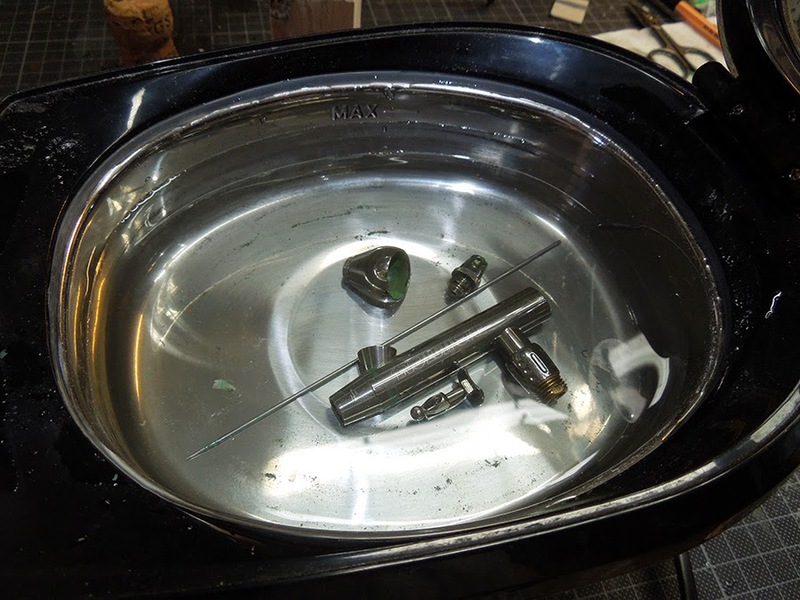 Now step by step assemble your airbrush again. Wohow! Look what I found while inserting the needle. Blah, more dirt. Well, I was a little lazy again it seems, but as all the dirt is pushed through by the needle it is not that bad. Cleaning visible top of the needle again and repeating that step helps to really get a hold of all of the old colour dirt. 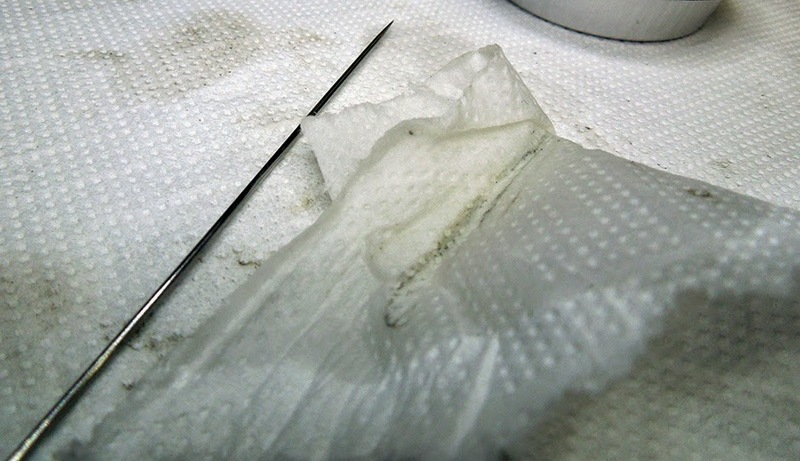 Well, done, this is what I needed to clean my Airbrush properly, big-time. I am pretty happy that it is not that worse anymore. 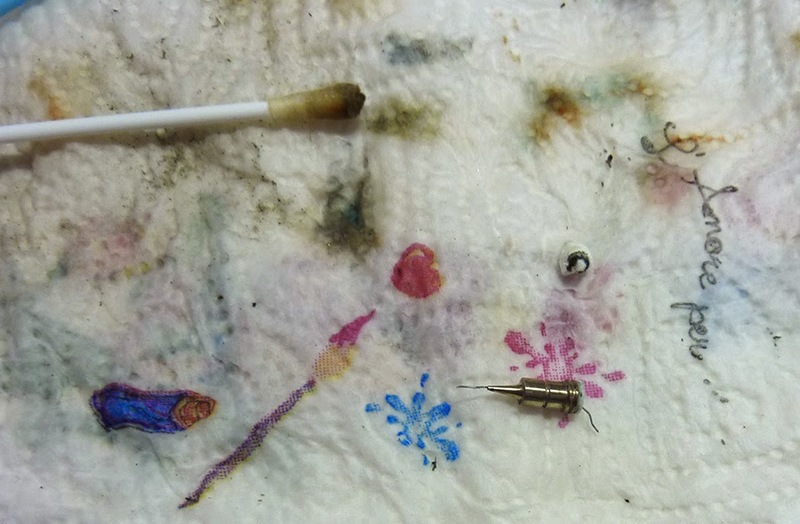 I really had occassions where the white tissues looked like mad from all the dirt I found in my airbrush. As mentioned, do it regularly and you can avoid most of the stress. It is a necessity and you can not avoid it. Do it and you will have a lot of fun with your Airbrush. If I look back I think I have worked at least two years with an unfunctional airbrush, but still had my fun. One day Raffa explained it to me big time and the difference in working with it afterwards was marvellous. 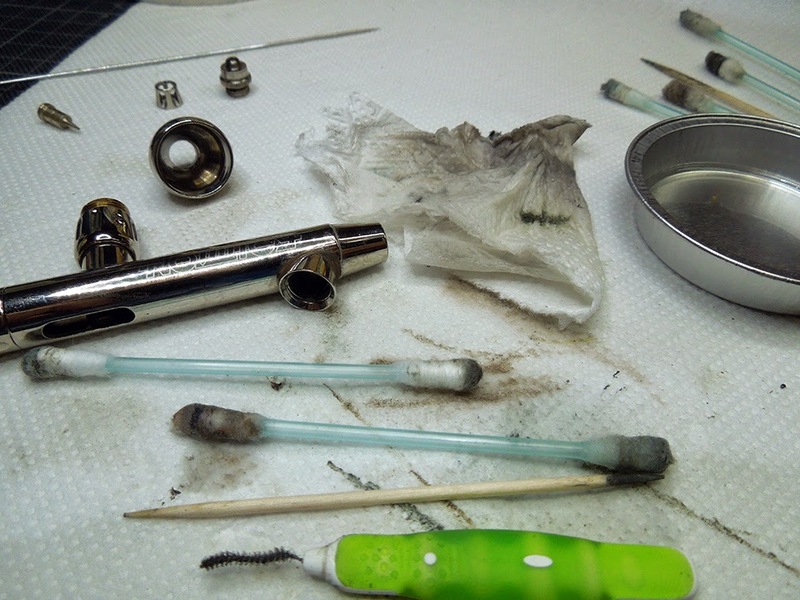 If you are scared of deassembling your airbrush, just don't be. 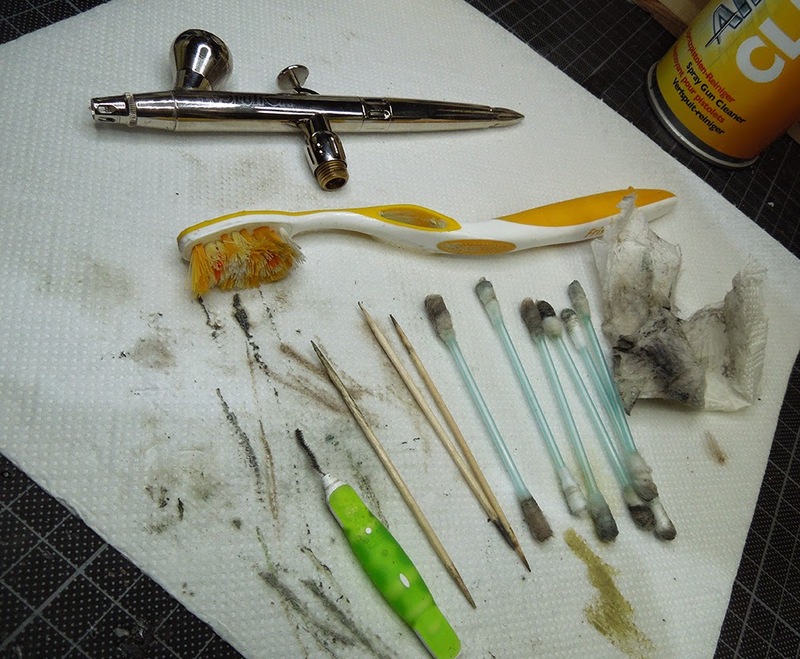 If you are new to airbrushing, take your gun and deassemble it in a moment that you just take for this task. Take your time, deassemble it, understand it and assemble it again. 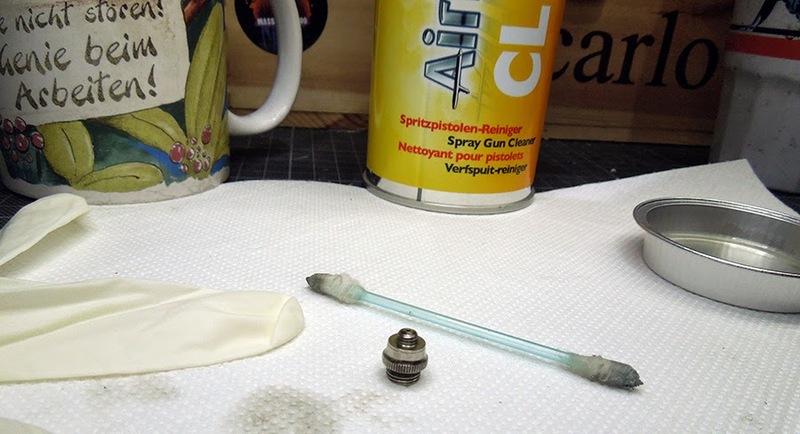 If you do this more often you won't have any troubles cleaning your airbrush gun quick or big-time. 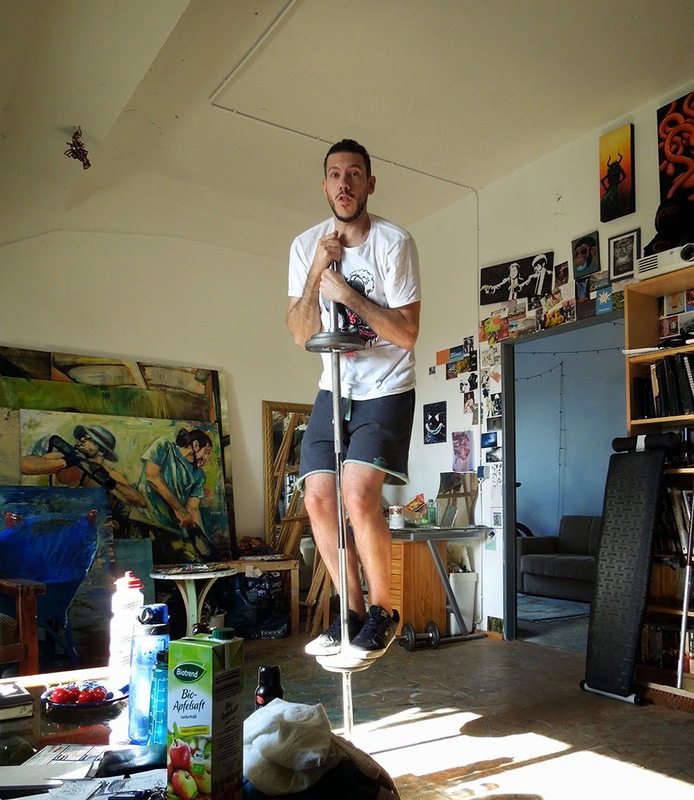 I hope you enjoyed the article and always remember there is the right music for every task in our hobby. Importent tips for beginners,safe money at the time. This will be added asap to the article. Thanks! Great article , will have a look if I can use our ultrasound cleaner at work . Wow your cleaning procedure is so much informative. I am looking for these types of information last few weeks. At last I find your article. This is so much informative for me. Thanks for your article .I hope you will continue you’re writing for us. I also read an article like this. u can also gather more information from this.